EDITOR’S NOTE: Watch part two of Soledad O'Brien's interview with Sheryl Sandberg on "Starting Point" at 8:30 a.m. ET on Tuesday, March 19th. There has been much debate over a controversial new book written by Facebook COO Sheryl Sandberg. It's called "Lean In: Women, Work, and the Will to Lead." The book is filled with advice encouraging women to be leaders in the workplace and rid themselves of the stereotypes that hold them back. Some critics say, though, that Sandberg's is unrealistic for women who are trying to balance work and family. Soledad O'Brien had a chance to sit down with Sandberg in Facebook's New York office. She asked about Sandberg's reaction to the controversy surrounding her book and how men can help women "lean in" in their careers. In the gallery above, check out our behind-the-scenes photographs from the shoot. 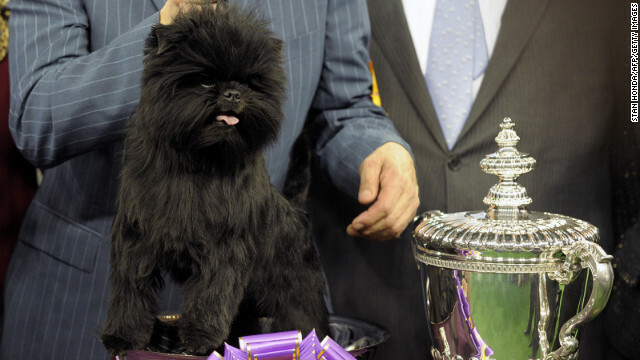 "Banana Joe," was named Best in Show at this year's 2013 Westminster Dog Show. He appeared on "Starting Point with Soledad O'Brien" Thurs., Feb. 14th. 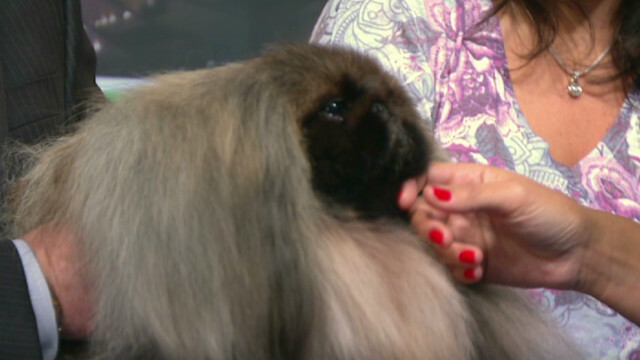 EDITOR NOTE: "Banana Joe," the Affenpinscher who won Best in Show at this year's 2013 Westminster Dog Show, appeared on "Starting Point with Soledad O'Brien" live this morning. Check out the segment here. We here at "Starting Point" are used to covering hard news stories, and speaking to big newsmakers. But what you may not know is...we've got a big soft spot for dogs. Like, epic. So when we heard that the 2012 Westminster Best in Show, Malachy, his owner David Fitzpatrick, and two new breeds were coming to visit "Starting Point"... why, we jumped for joy! The dogs arrived promptly to our Time Warner Center studio, and let's just say we were more than excited. The two new breeds in this year's competition were getting ready for air: Perla, a Russell Terrier and Meg, a treeing walker coonhound. The green room...had gone to the dogs. One even admired the view of Columbus Circle just before the big blizzard hit the Northeast. This dog was up pretty early, so a big yawn was to be expected. And was adorable. We thought about resurrecting the dog cage we were hoping to use for the Puppy Bowl guests, but we quickly realized that the awesomeness of Westminster dogs couldn't be contained. Even our crew were smitten with the dogs. While we got the set ready for our four-legged guests, 2012 winner Malachy and his owner had to make sure his hair looked just right. Yes, the grooming does take a while. Of course, shenanigans were bound to occur once the dogs got a look at each other. Soledad was only too excited to meet the new breeds and reigning champ! Malachy was especially happy to see Soledad. Everyone had a great time and we were sad for the segment to be over. But we knew we would be speaking to Banana Joe, the 2013 Westminster Dog Show winner on Thurs, Feb. 14th, so we were happy again. John Berman might have fallen in love just a little bit. And Soledad...well...let's just say dogs really like Soledad. If you missed our segments with Malachy, Perla, Meg and Banana Joe, check out the video below. The "Starting Point" team was thrilled to have Mika on set today to talk about his career and his latest album. We wondered if he could share some of his singing talent and tips with our very own Soledad O'Brien. Turns out our anchor has a pretty awesome voice! Check it out in this web extra. While Soledad O'Brien prepped for her interview with Julien's Auctions founder & CEO Darren Julien we gave a small camera to Starting Point PA superstar Crystal Overstreet to get some photos of the items on set. 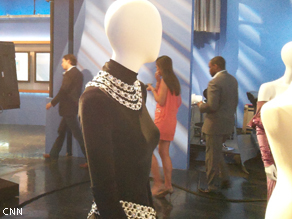 Take a look at what she saw as the mannequins were prepped for air. After his "Starting Point" interview, "Shahs of Sunset" star Reza Farahan expounds on the awesomeness of his mustache. In a break on Starting Point set: Jay Roach, Brett O'Donnell & Soledad O'Brien talk about the HBO movie 'Game Change' and candidate debate prep. After his "Starting Point" appearance this morning, Newark Mayor Cory Booker chats about his appearance and if a regular TV job is in his future.